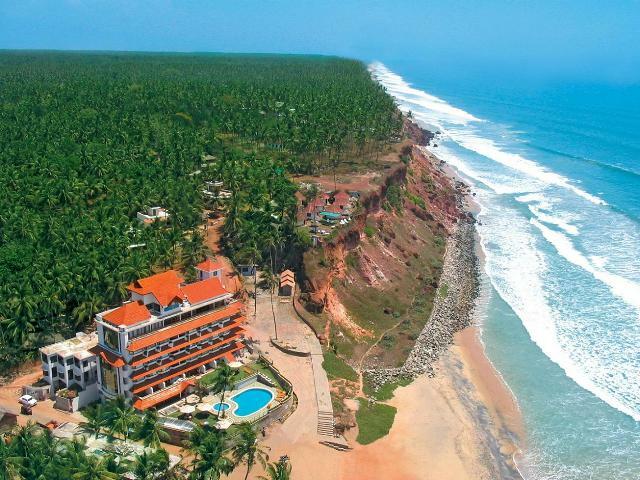 Varkala Beach is a quiet and isolated sandy expanse where you can have a relaxing beach holiday. Most importantly Varkala offers relatively untouched and clean beaches that are increasingly difficult to find in Kerala. It is also famous for mineral springs and Ayurvedic massages. A high rocky cliff ends abruptly and a stretch of clear sand extends down to the sea, Varkala has got an excellent location. The contrast between the cliffs, sand and sea makes it a striking sight. The sunset at this palace is truly breathtaking with the sun sinking into the sky like a ball of molten gold as the sun and sea are tinged with crimson and vermilion. Varkala also houses a leading pilgrim centre in Kerala. The 800-year old Janardhana temple, dedicated to Ayyappan and Hanuman, atop the hill has brought a sobriquet for the region, Southern Kasi (Benares). However, Non-Hindus are not permitted to enter the inner sanctum but can hang around the temple. Varkala beach is also called ‘ Papanashini’ since it is believed that a dip in the holy waters of Varkala beach will purify your body and soul.